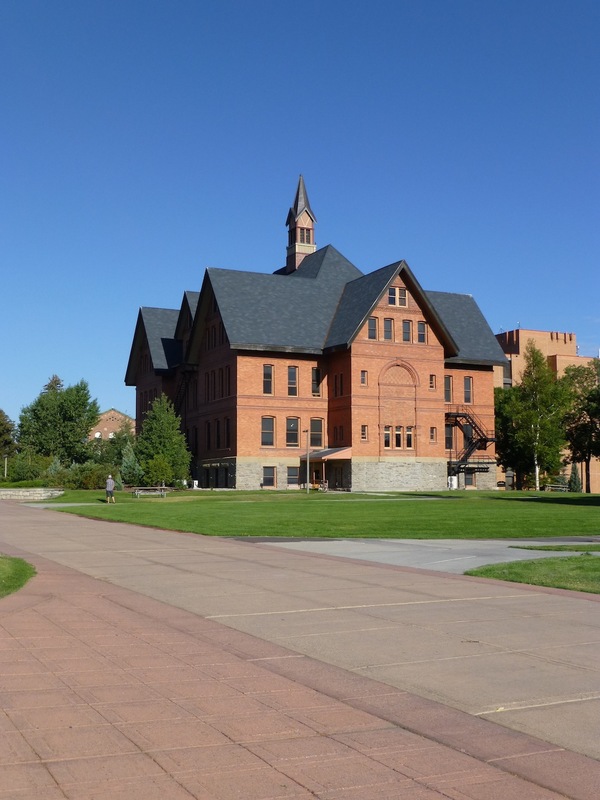 UMW is unique in the Montana system in that classes are offered on the block schedule; in this way, they’re very much like Colorado College or Cornell College. Students take one class at a time, three hours a day for 18 days. Classes meet either from 8:15-11:15 or from 12:15-3:15, and the students may NOT take 2 classes during the same 18 day block. At the end of the block, they get two extra days off (so a four-day weekend) and then will start their next class. Classes are capped at 25 with an average of 18. Half the students are in Education, but Business and Biology are also popular. Geology is the most prestigious, and Natural Horsemanship is the most unique. This is a small, compact campus with 1400 undergrads. Almost 2/3 of the students are from Montana. For those flying in, Bozeman is usually the most convenient (more flights), but Butte is closer (60 miles). The drive from Bozeman is an hour and 45 minutes. 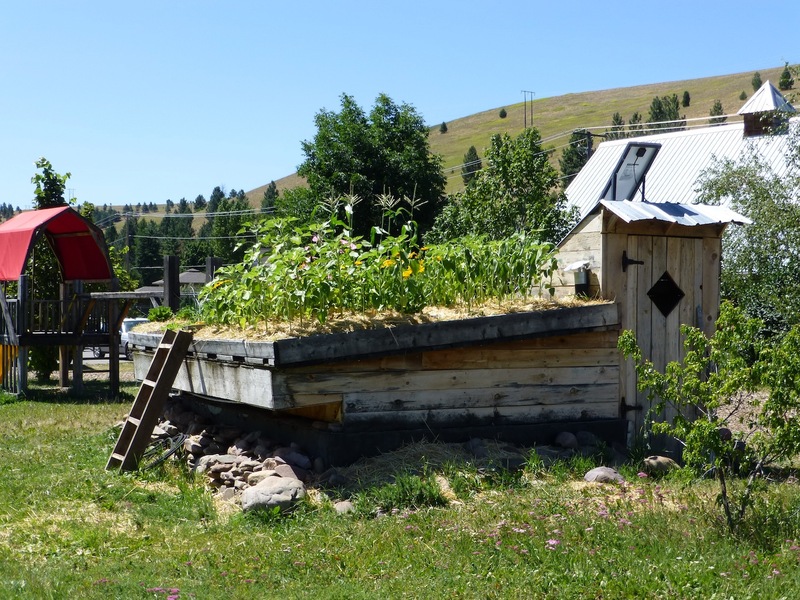 There is definitely a rural feel with the school located near Continental Divide and Ranches. Freshman must live on campus. 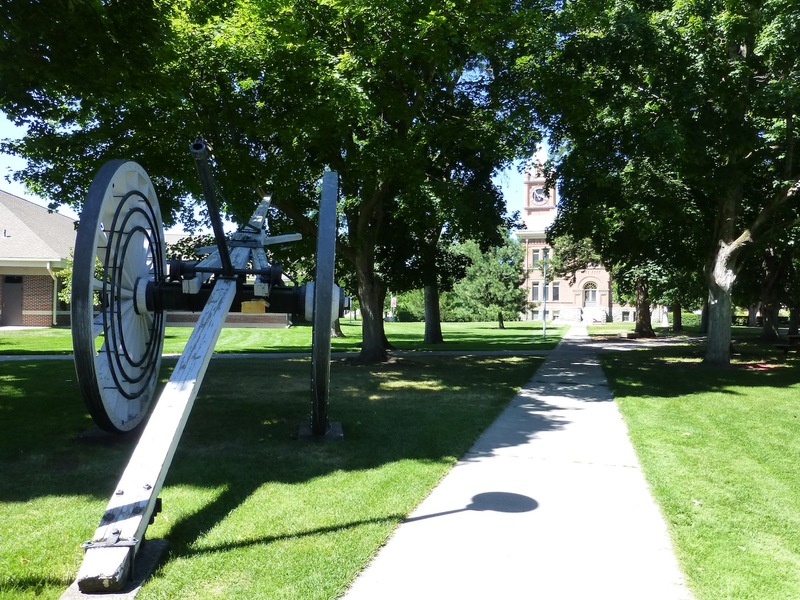 Montana Tech mirrors Colorado School of Mines for engineering. It is specifically a STEM institution with 3000 students. Their mission is to help students from wherever they are; if they come in with less math than they need, they will provide the resources and help for students to catch up and have a decent amount of success with this: students who come in ready with only College Algebra rather than Calculus have a 60% success rate in their engineering program. Job placement is high with a 96% career placement over 10 years (with 99% of alum responding). They offer programs on two campuses: a two-year degree campus (which offers programs like metals fabrication) and a four-year campus with programs like mining and lots of engineering programs like environmental, petroleum, geophysical. These last two programs are also the two most recent doctoral degree programs. The university is located in Butte, a mining town. It’s described as blue-collar, historical, friendly, and proud. Students are primarily from Montana (80%); 8% of the population are international. Surprisingly, the gender imbalance is not as pronounced as might be expected given the type of school: only 59% of the students are male. There are also no fraternities or sororities. I would expect that the CIA would recruit at campuses in DC or at some of the big name schools; MSU was NOT one I expected to be on the CIA’s radar – but it is. Because of the strong Arabic program and the study abroad program in Morocco, the CIA, the Department of State, and other similar agencies regularly recruit MSU students. As part of their commitment to helping students find jobs, MSU host two career fairs a year (including the largest west of the Mississippi). More importantly, they’re invested in providing the students with a good education with a lot of support added to the end game of who they are getting connected with. MSU has started a major initiative to increase retention through community building initiatives and support systems. In the last two years, they’ve raised retention to 74.2% with a goal of 82% by 2014. However, four-year graduation rates still tend to be on the low side (a little over 50%) but they’re working on increasing this, as well. They’re looking at how students make the transition to college and develop ways to cope with all the newness of being a university student, how to be a citizen of the MSU academic community, and how to be an engaged Bobcat. They have implemented a First Year Initiative (a first year challenge which includes photo scavenger hunts and earning points that they can use around campus for food or at the bookstore). They are starting a Second Year Initiative, since the first two years are when students are most likely to leave. One of the best things they’ve started is a new policy stating that anyone who left MSU and did not attend another institution is invited to come back. All freshmen live on campus, as do many of the upperclassmen. During the Montana tour, we spent 3 nights in a 3-floor traditional-style (bathrooms down the hall) freshman dorm that. The rooms were relatively spacious with comfortable beds and lots of storage space. The cool thing is that students can paint the rooms any color they want; mine was a cheery yellow and green combination. The bathrooms were large and had enough showers to handle the group. Although there were over 50 rooms to a floor, the building didn’t feel that large because it was set up in a square with a courtyard in the middle. Each floor had a large tv lounge, and the first floor had more lounges, a 24-hour reception desk, and a dining hall. There are several options for students after the freshman year such as suites for upperclassmen, 21-and-over halls, and Greek Houses. The Greek system is very small (only 4% of the student population) with four sororities and seven frats. The houses are involved on campus and dedicated to tradition. They get involved in homecoming and giving back to campus and community – every house raises money for a particular charity. The physics professor getting a cinder block broken on his chest with a bed of nails underneath him. Why? To illustrate force and different laws of physics. student leaders get credits for leading the classes. However, this is not to the detriment of face-time with faculty. One of the tour guides told us that the “faculty really believe and invest in us.” We got treated to a 30 minute “Sample Physics Class” which was the most entertaining and informative things I’ve seen in a long time! The professor was funny and explained things so well. I wish I could have taken a full class with him! The student activities board and by the student life department host lots of on-campus activities, including speakers and performers, and students take the initiative on many of these, including throwing PowWows to celebrate the heritage of the Native American students on campus. School spirit is huge, and the Cat-Grizz (MSU-UM) game is as big here as it is on the UM campus. Football (in which they’ve been Big Sky Conference champs on multiple occasions) is only one of fifteen DI sports. Off campus, there are three easily accessible world-class ski areas within an hour (Bridger Bowl is 20 minutes away); kayaking, hiking, and other outdoor activities are also popular. This is much more of a skiing community than Missoula because Bozeman tends to get more snow. 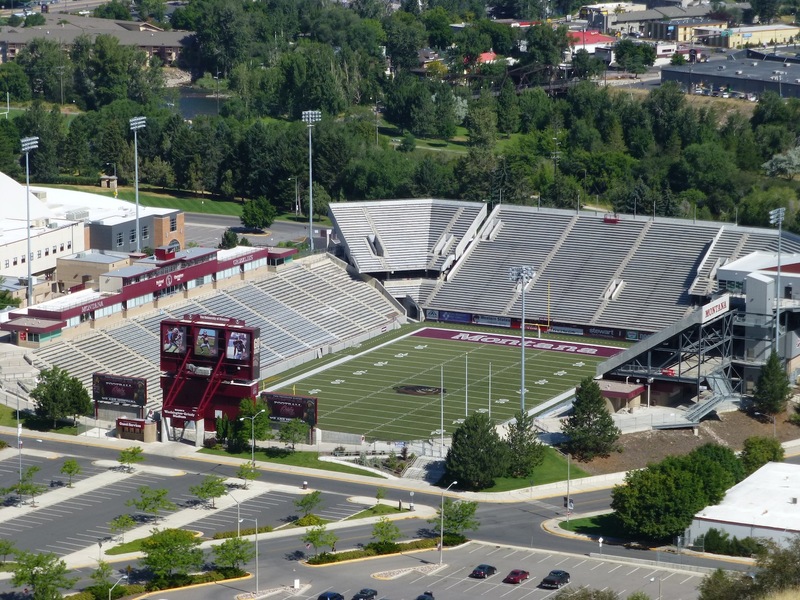 Bozeman is also a smaller city than Missoula so it is a little more compact and community-oriented. Town-gown relations are good. One student talked about how local businesses paint their windows blue and gold during homecoming. Campus is very attractive with lots of brick and open space. There is a nice mix of older (but well maintained) buildings and new construction. The students and admissions people only cited a couple problems with the university; parking, as usual, seems to be an issue, but again, this is relative. It’s nowhere near the problem I’ve seen on a lot of campuses. The second issue brought up was that of the growing student population. Enrollment has increased, including lots of out of state students which is an “interesting challenge for infrastructure, access to classes, space, etc.” There are some creative solutions like changing around T/TH class times to fit in another class at the end of the day to make sure that students are getting into classes they need, again indicating that the administration is listening and responding to issues. 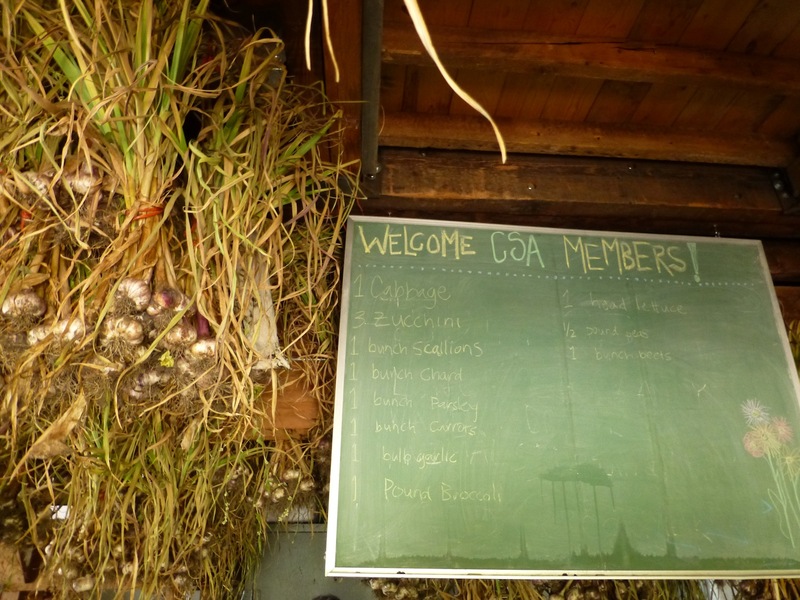 The Plant Growth Building which houses 18 greenhouses; they can recreate any climate from Alaska to Hawaii and grow plants from that ecosystem. Students majoring in Engineering are required to take the national Fundamentals of Engineering Exam and have historically exceeded national average, usually scoring between an 88-92% on the exam. Mechanical Engo is the largest major. Their five-year MArch program is a 4+1 program. The Dean of the program says that this is a good fit for students who like solving problems, are good with their hands, like math and drawing, and are comfortable coming up with many different answers. The program stresses hand-drawing as well as digital art, and students start in a design studio the first day. They do have a second year “Gate” in which students apply to continue in the program after their first year. They have 91 spots available. Although about 180 students start as freshmen in the program, many self-select out during the first year, another reason to get them in the design classes right away. Of those who apply to continue during their second year, 70-80% will be able to continue. Their 4-year grad rate with a BA is high (in the 90s), and 80% of the graduates will continue on for the extra year to get their MArch from MSU. MSU provides several Study Abroad options in places like Rome, Nepal, and South American which many MArch students usually can’t do because of the intensity of the program. One of the reps described the climate in this way: “Students are active, faculty is accessible, and the facilities promote creativity and innovation.” This seems to be backed up by the fact that the university has been listed nationally in the Top 20 for recognized research. Students in any discipline can apply for grants of $1500/year + $300 for materials and supplies; because of this, they’ve seen a 150% increase in number of research projects going on around campus. The Museum of the Rockies is also right next to campus. It houses the world’s largest collection of dinosaur bones and is a good resource for students in other areas as well. UM has a classic university feel with big brick buildings and a large oval quad; it’s not only a beautiful campus, but it’s a manageable/ walkable size and it all seems to fit flow. As part of the counselor tour, we stayed in one of the traditional dorms for the first 3 nights. The rooms are a bit on the small side, but certainly livable. However, there was always a rush on the bathrooms which didn’t seem big enough to take care of the needs of the population on the hall. Some of the rooms were traditional doubles, and others were set up in “pods” – a common room with three single rooms off of it. None of the rooms had sinks, but the common rooms of the pods had a small fridge and microwave. None of the residential halls had AC, which students sited as one of the things they would change if they could. Only 2 of the dorms are higher than 4 floors, and all but 1 building are clumped together on one side of campus. The main building with the M Mountain behind it. Mostly, students are really happy here. There’s a lot to do on and off campus. The Grizz-Cat (UM-MSU) rivalry is huge, and the annual football game sells out. One student said “I don’t even like football, but I look forward to the game every year!” Tailgating is huge, and people get really pumped up. School spirit is huge, and they turn out for a lot of games in different sports. They also like the accessibility of skiing and hiking, but say that even non-outdoorsy people fit in and find a lot to do. The movie theater is in walking distance as are restaurants, the local ice cream place, and pubs. Shuttles run frequently. First Friday (open art galleries) is popular. One of the on-campus perks that got a big shout-out is that there are resident IT students on call four nights a week who can be called to help trouble-shoot printer, internet, or computer problems. The biggest issues that students complained about was the parking situation(but that takes on an entirely different meaning here than on a really large campus), and off campus housing can be difficult to find, but not impossible. Most students find things close enough to walk or ride bikes. One of the first events we attended as a group was the Dean’s Panel where 9 Deans gave presentations about their respective colleges. The Arts and Science college is the largest on campus with a lot of collaboration across departments and across colleges. Students can find their niche in the college but have the flexibility to try a lot of things. One of the most unique offerings in this college is Irish Studies which includes language study (the only place west of the Mississippi to offer it), culture, dance, etc. They offer exchanges with various places in Ireland. They also have a nationally recognized Native American Studies program in which student are engaged in the communities in Montana and around the country. 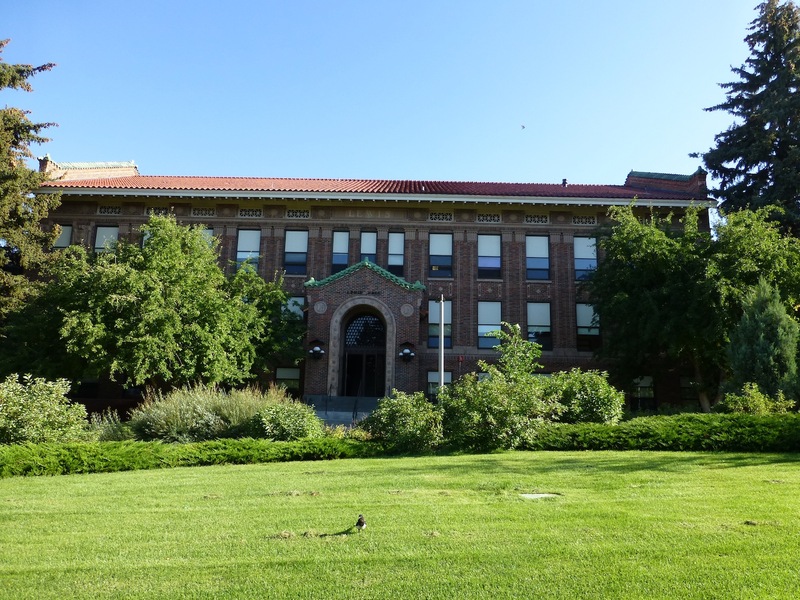 Their Environmental Studies program is also nationally ranked, and there are lots of pre-programs (nursing, law, medicine), and advising for these programs is extensive. Their system of professional and faculty advisors for all majors is strong. 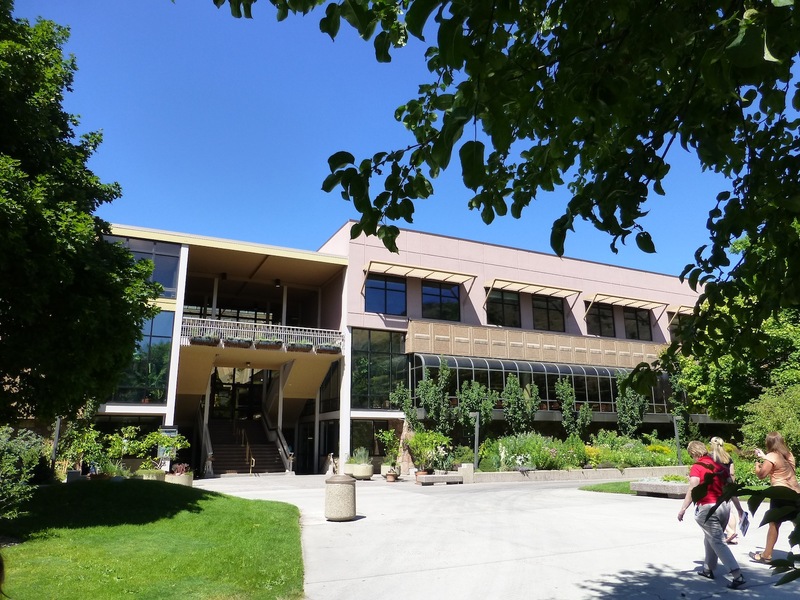 The university also runs a biological research center on Flathead Lake (the largest freshwater lake west of the Mississippi). Why studying/doing research here, the students can live in university-provided housing. The Certificate Program in Entertainment Management (only Vanderbilt and Cornell offer this, as well). 600 students are enrolled in the program which is the most interdisciplinary in the business school. They’ve even been on the cover of Poll Star Magazine. The Entrepreneurship Program which is an Endowed program. Students participate in a statewide competition in which 50-75 business plans get sent in. They pick 15 as semi-finalists who come for 2.5 days to compete for the $10,000 first prize; all of them get to present to investors, so even without winning, they get exposure to potential funding. The College of Technology (soon to be Missoula College, Univ. of Montana) is a 2-year college attached to the main university. Students come from all over the country, and they become part of the university – they live on campus, they use all the facilities – so they get a two-year experience on a four-year Research-1 campus. They have access to smaller classes in 35 programs across five departments (including Applied Computing and Electronics, Culinary Arts, Diesel Welding/Heavy Equipment Operations, and Health Professions). Admission to the College of Tech only requires a HS degree or GED. If they earn 12 credits with a 2.0, they can transfer automatically into UM. The School of Health offers complete accredited programs like Pharmacy (including a 2-4 PharmD program or a 4-3 program if they come in with a BS in a related area like kineseology), PT, Public Health, and Social Work (both BSW and MSW). All accredited. Only programs in the state. In the Visual and Performing Arts College, students can do work in Fine or Visual Arts, Music, Dance, and Theater among other areas; they also have large offering for non-majors. Their $250,000 in scholarship money went largely to those majoring in the school, but some were offered to non-majors if they participated in marching band or for people who play “in-need” instruments. Many study abroad offerings for the majors include Vienna (Art History, Music, etc) and Bali. Dancers performed at Kennedy Center – selected 2/3 years to perform there. Some unique programs to be aware of are the Digital Art/Animation degree and the BFA in Sonic Art (recording engineers, sound in film or live concerts). In Education and Human Sciences, students come in as a major in the particular subject and then apply to pick up licensure. Other majors include Communicative Sciences and Disorders (with a clinic open to the public providing lots of research and hands-on for the students), Clinical and School Psych, Health and Human Performance (athletic training, exercise science, health promotion) and Work physiology and Human Metabolism. This had been used to haul logs using horsepower; it now sits outside the Forestry Building. 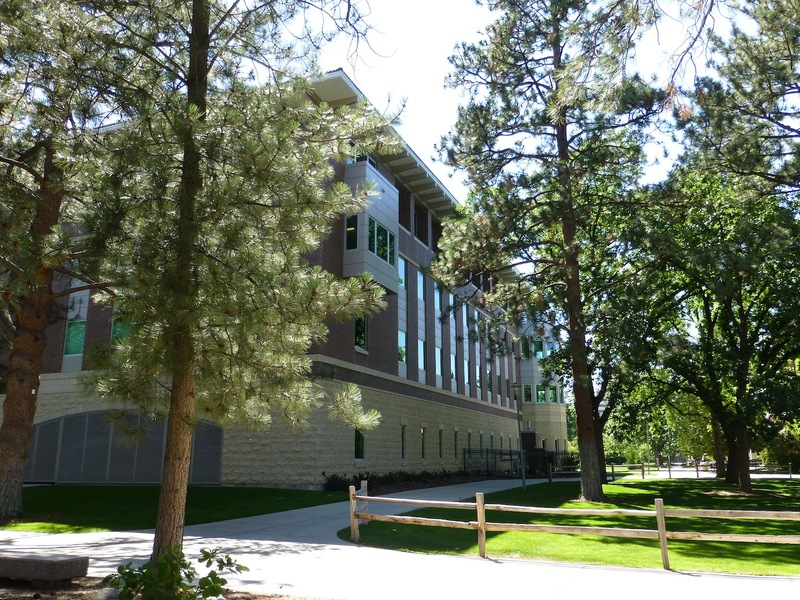 In the College of Forestry and Conservation, students can mix disciplines such as education, environmental law, and computer applications. It’s important to know that most students in this field will need a Masters for a permanent position. Wildlife Forestry is the largest program in the college (about 40%), and students can focus on terrestrial or water studies. The newest major is Wildland Restoration which deals with reclaiming land, invasive species, and fire control among other things. Students interested in more of a business side can major in Parks Recreation and Tourism Management to become such things as Park Rangers, Land Stewards, or work in a Nature Conservancy. Students can do work over the summer in Fiji, India, Vietnam, and other places, as well as learn winter rescue techniques in Montana and White-Water rescue in Costa Rica. The 1st year revolves around small seminars (examples: Doing the Right Thing, Truth vs. Truthiness) in which they explore a big, enduring question having to do with public health, world poverty, economics, etc. The 2nd year moves into Models of Leadership. Students participate in retreats, lectures, workshops, etc. During the 3rd year, the program will help fund an internship, study abroad, research, or service learning (maybe pay for airfare, etc). Students have to do one of those. The 4th year is the capstone in which students work together in groups of about 15 on one of the big problems. For example: if they’re interested in malaria, they’ll be put into a multi-disciplinary group to problem solve, so they could be working with a biologist, linguist, business major, and education major. The project they complete could be an ad campaign, writing grants, etc.